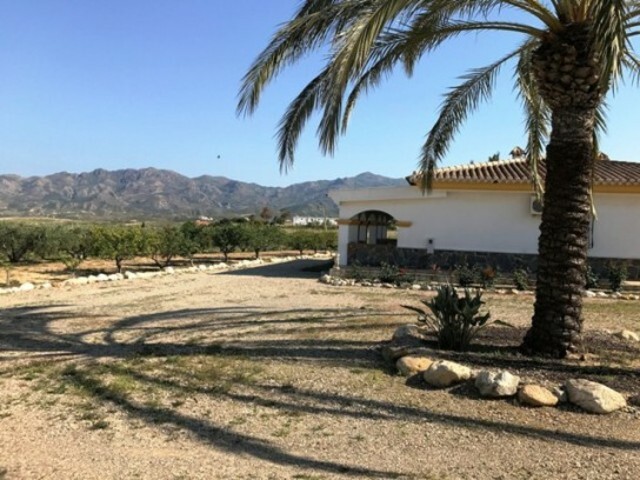 A lovely 3 bedroom 1 bathroom detached villa measuring a very comfortable 119m² sitting with a spacious plot of 5,000m². This property enjoys great mountain views yet is located just a short walk away from a couple of local bars & restaurants. The village of Antas is just 3km away and here you will find all daily amenities, including shops, supermarkets, pharmacy, banks, bars and restaurants as well as a weekly market. Access to the plot is via gates with the driveway leading up to the property with terraced plots suitable for planting fruit trees etc on either side. At the end of the driveway you will see a beautiful fountain then a set of stairs lead up to a covered terrace with wooden beams and views of the surrounding countryside. This terrace is a great size measuring the length of the property and is perfect for al-fresco dining. The driveway continues up and behind the property with a further terraced plot and the double garage with storeroom. To the rear of the villa there is also a barbeque area with direct access into the house via the larder. As you enter the villa a lovely entrance hall immediately portrays the rustic style of the property, including the exposed ceiling beams. To the right you will find an open plan living/ dining room & kitchen which is a fantastic size and very light & bright thanks to the patio doors & windows overlooking the covered terrace and BBQ area. The living area boasts a feature stone fireplace with log burner whilst the kitchen benefits from beautiful wooden units and a central island incorporating the oven and electric hob. A door from the kitchen opens into a large larder/storeroom with a second door leading onto the rear terrace & BBQ area. A hallway from the entrance hall leads to 2 spacious double bedrooms on the right, followed by the family bathroom on the left. The master bedroom at the end of the hall completes the internal layout and this is a great size. There are fly screens on all of the windows throughout the property and a central heating system is powered by the log burner in the living room. Furniture can also be included in the sale, subject to negotiation. Antas is well located with great access to the motorway and nearby beaches and golf courses. The resort of Mojacar is approximately 15-20 minutes away whilst Almeria airport can be accessed within 45 minutes.